A restaurant at 80, The Hundred, in Romsey is said to be a former women's workhouse from the mid-18th century. Another workhouse was built in 1774 on the north side of the Winchester Road to the north-east of the town. A parliamentary report of 1777 recorded parish workhouses in operation at Romsey Extra for up to 150 inmates, and at Romsey Infra for up to 60. Hampshire: East Dean, East Wellow, Lockerley,, Mitchelmarsh (2), Mottisfont, Nursling, Romsey Extra (5), Romsey Infra (4), Sherfield English, Timsbury. Later Additions: Dunwood (from 1858), Rownhams (from 1897). Wiltshire: Plaitford, West Wellow. Later Addition: Melchet Park. The population falling within the union at the 1831 census had been 9,969 with parishes ranging in size from Timsbury (population 165) to Romsey Extra (3,386). The average annual poor-rate expenditure for the period 1832-35 had been £8,141 or 16s.4d. per head. 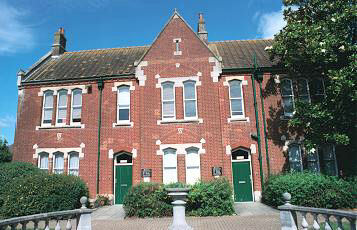 The new union took over the existing Romsey parish workhouse on the Winchester Road. It was enlarged in 1836, for which the Poor Law Commissioners authorized the expenditure of £900. It was a relatively small U-shaped building, with ancillary buildings at the north. Males were accommodated at the west side and females at the east. The original layout of the site is shown on the 1865 map below. Building.— The site is in all respects a good one, and there is a large garden attached to the workhouse. The house is an old one, enlarged and improved, and has sufficient accommodation for the inmates of all classes, in all ordinary demands on its capacity. There is a detached ward for infectious cases, containing two rooms, which have up to the present time been found sufficient for the purpose. There are no separate sick wards for children. The ventilation, light, drainage and water supply are all good, and the sanitary state of the house is excellent. Furniture.— The beds are stuffed with flock and straw, and troughs are attached to the pumps for washing. Inmates.— The inmates are classed in separate wards, according to the Order, but the same yard is used by the aged men and women, and boys and girls, that yard being a portion of the garden in front of the house. The men and boys wear fustian jackets and waistcoats, and corduroy trowsers. The women and girls gowns and upper petticoats; and all classes have a sufficient supply of warm under clothing of all sorts. The able men break stones; the aged and infirm are employed in gardening, and the women in household work, washing and making and mending linen. The old and infirm, and the children of both sexes, have the use of the garden in front of the house for recreation. Medical Attendance.— The drugs for the use of the house are supplied by the medical officer. Nursing.— There is no paid nurse; the nursing both by right and day is reported to be well performed. Chaplain.— A chaplain is appointed, and officiates in accordance with the regulations expressed in the Orders. Any of the inmates who dissent from the Established Church are allowed, if they think proper, to attend their respective chapels. School.— There are two schools in the workhouse, one for boys, the other for girls; but the children are not separated from the adult inmates further than having day rooms and dormitories exclusively appropriated to them. Generally.— This workhouse has been always conducted in a satisfactory manner, but It is defective, in having no separate yards for the children and aged inmates of both sexes — a defect which requires to be remedied — and separate sick wards for the children should be provided, and a paid nurse appointed. In 1870, a separate infirmary was added on the male side, to the west of the main building. In 1890, a new female ward was added, followed by a separate female infirmary in 1900. A chapel was located to the east of the main block. The expanded buildings are shown on the 1908 map below. The view below, from around 1905, shows a view of the buildings from the south-west. 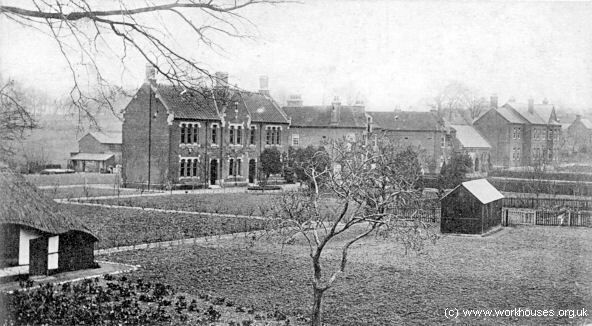 Romsey workhouse from the south-west, c.1905. 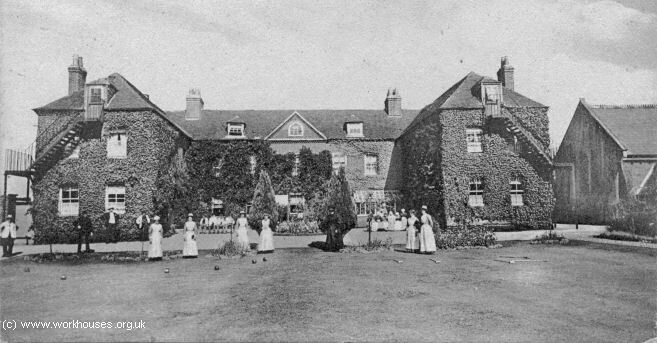 Another view from around 1906 shows some of the staff playing croquet, with some of the workhouse inmates as spectators. Romsey workhouse staff croquet game, c.1906. Romsey workhouse staff croquet game (detail), c.1906. After 1930, the former workhouse was redesignated as a Public Assistance Institution under the control of Hampshire County Council. New casual wards were added in the early 1930s. After 1948, the site became an old people's home known as The Gardens. The main building was subsequently renamed Nightingale House. The main workhouse block has now been converted to flats. Romsey workhouse from the south-east, 2000. The 1870 infirmary is now partly occupied by the Romsey Register Office. 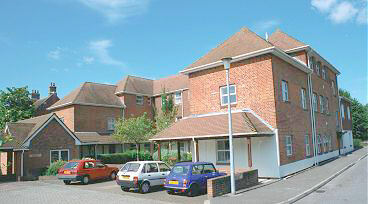 Romsey workhouse infirmary from the north, 2000. Hampshire Record Office, Sussex Street, Winchester SO23 8TH. Holdings include: Guardians' minute books (1851-55, 1858-63); Register of deaths (1835-1925); Register of births (1925-31).